Stamattina dovevo annaffiare le piante, il giardino ed il mio orticello però la pioggia mi ha salvata...Finalmente un po' di acqua, adesso si può respirare. Siamo nella stagione delle pesche e a me piacciono tantissimo. Qualche giorno fa ho visto questa ricetta e ieri ho pensato di provarla. E' un dolce molto veloce, con pochi ingredienti. This morning I had to water the plants, the garden and my vegetable garden but the rain saved me ... Finally, a little bit of water, now you can breathe. We are in the season of the peaches and I really like them. A few days ago I saw this recipe and yesterday I thought to try it. It is a very quick dessert with only a few ingredients. Ho lavato le pesche e le ho tagliate a fettine non troppo sottili. In una ciotola ho sbattuto le uova con lo zucchero fino ad ottenere un composto chiaro e spumoso. Ho aggiunto la farina, la cannella, un pizzico di sale, il latte, il brandy e ho mescolato con delicatezza. I've washed the peaches and cut them into slices not too thin. In a bowl, I whipped the eggs with the sugar until the mixture became light and fluffy. I added the flour, the cinnamon, a pinch of salt, the milk, the brandy, and I mixed gently. Ho imburrato una pirofila e lo cosparsa con zucchero così da evitare che il clafoutis si attacchi. Ho messo le pesche sul fondo della pirofila e ho versato sopra il composto. I buttered a baking dish and sprinkled with sugar so that the clafoutis to avoid sticking. I put the peaches on the bottom of the pan and poured over the mixture. Ho infornato per 50 minuti fino a che il clafoutis è diventato dorato. A 5 minuti dal termine della cottura ho spolverato il clafoutis con zucchero semolato e ho rimesso in forno con il grill acceso per caramellare lo zucchero in superficie. Si serve tiepido magari accompagnato di una bella pallina di gelato. I baked for 50 minutes until the clafoutis has become golden. At 5 minutes from the end of cooking I dusted the clafoutis with icing sugar and I put it back in the oven with the grill to caramelize the sugar on the surface. Serve lukewarm, perhaps with a nice scoop of ice cream. 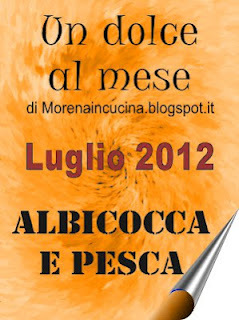 Facendo un giro dei miei blog preferiti ho trovato un bel contest "Un dolce al mese - luglio 2012 - Albicocca e pesca" a quale vorrei partecipare con questa ricetta. Taking a tour of my favorite blogs I found a nice contest "A sweet per month - July 2012 - Apricot and peache" and I would like to participate with this recipe. Vi auguro un weekend bello e rilassante! Have a nice and relaxing weekend! Adoro i clafoutis!!! Quest'anno non ne ho ancora preparati ma devo sbrigarmi!!! Il tuo è golosissimo! Buono-buono-buono! Il clafoutis è un dolce semplicemente irresistibile e questa tua versione non mi smentisce! Singapore, Hong Kong or Bangkok? And now let me explain why for me is definitely Singapore. When we've decided to relocate in Asia, we've had some options: Singapore, Hong Kong or maybe Bangkok. 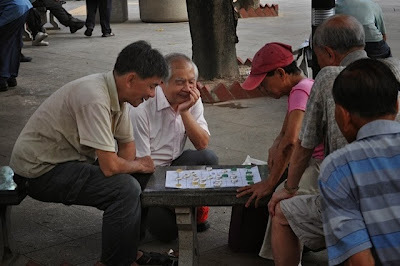 Some times ago we spent a weekend in Hong Kong and last weekend we did a little trip in Bangkok. Hong Kong is a very nice city, old and new, restaurants, public transport and lifestyle quite good. The thing that I didn't like was that is too crowdy and chaotic, seems that nobody sleeps in this city. E ora lasciatemi spiegare perché per me è sicuramente Singapore. Quando abbiamo deciso di trasferirci in Asia, abbiamo avuto alcune opzioni: Singapore, Hong Kong o forse Bangkok. Qualche tempo fa abbiamo trascorso un fine settimana a Hong Kong e lo scorso fine settimana abbiamo fatto un piccolo viaggio a Bangkok. Finally I managed to do it! 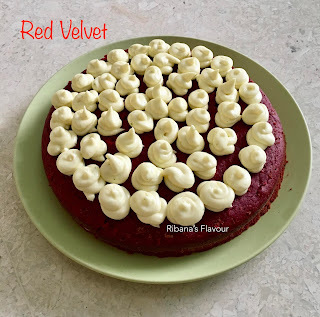 Is quite a long time now that I'm fancying at doing the red velvet cake. But you know, when you're renting and you move every 2-3 years is difficult to have all the things in the kitchen but even with the simplest utensils, you still can make it. My inspiration comes from the recipe of Ernst Knam, the Italian Chocolate King. 31 December 2013 - happy New Year everyone! And today is the last day of the year. I'm still in the office and I think that is the first time that I'm working on 31 of December. But anyway I cannot complain. I had a very interesting year, full of changes and new challenges. 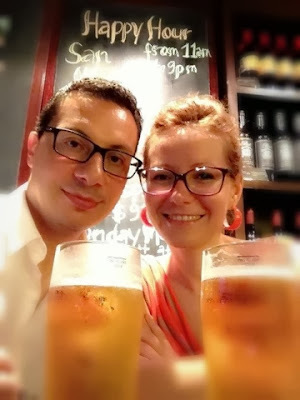 This year, end of January we relocated in Singapore and I can say that we have started a new life...we speak a new language, have a new home, a new job....everything new, starting from zero....only with a lot of love and confidence in our hearts, and it worked!! Now, we wait 2014, another year full of other challenges! I wish you a very happy New Year!!! E oggi è l'ultimo giorno dell'anno. Sono ancora in ufficio e penso che è la prima volta che sto lavorando il 31 dicembre.